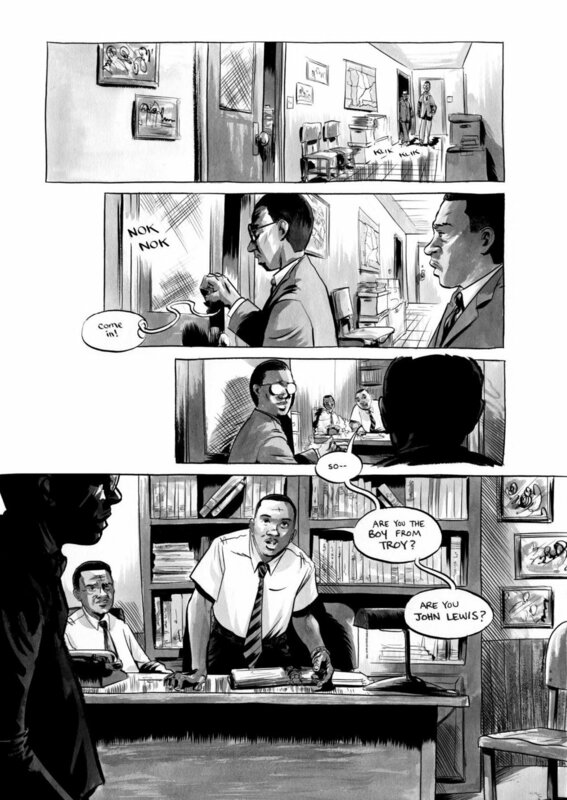 This April, we're celebrating Letter Writing Month with Andrew Aydin, co-author, with John Lewis himself, of the graphic memoir series March, which details the civil rights journey of congressman and activist icon John Lewis. In his foreword to the newly released MARCH: 30 Postcards to Make Change and Good Trouble, Andrew Aydin offers a heartfelt ode to the importance and beauty of letter writing. We're honored to share an excerpt from his foreword with our readers, and hope that it inspires you to get writing--to your loved ones and friends, or to your congressperson or the president--before the month's end. From March: 30 Postcards to Make Change and Good Trouble by Andrew Aydin, John Lewis, and Nate Powell (Chronicle Books, 2018). If you know about Congressman John Lewis, or if you have read March, you probably know that John Lewis first met Martin Luther King, Jr., by writing Dr. King a letter asking for his help in desegregating Troy State College, now known as Troy University, in Alabama. Dr. King wrote back and sent John Lewis a round-trip Greyhound bus ticket to visit him in Montgomery. That letter, and its response, set John Lewis on a path that helped reshape the moral landscape of our nation. Perhaps then you can understand my own trepidation when I started my first job working for Congressman Lewis: answering his mail. Even after serving on his staff for more than ten years, making “Good Trouble” into #goodtrouble, and writing three graphic novels with him, I can still remember the intimidating awesomeness of the sight of so many bins, boxes, and stacks of unopened envelopes from those first days. You might think of it as starting in the mail room, except you would be overstating the available space for such a task if you believe there is a whole room in a congressional office available to devote to opening, sorting, and responding to the mail that has poured into his office nearly every day of his more than thirty years in the U.S. House of Representatives. No; it was simply a desk, where the office refrigerator once sat, among nearly a dozen other desks, tightly packed and partitioned, in a room built more than a century ago. Epistles arrived at the office in droves, filled with all-too-human stories of tragedy, pleas for help, and beautifully plainspoken descriptions of how the policies debated in Washington should be viewed in a context far larger than merely numbers on a page or entries in a ledger. It took a little while to find my way, but eventually I realized I had been training for this nearly all of my life. My training began with thank-you notes. I’ve been told this is a distinctly Southern experience. My mother’s rules were unequivocal: handwritten and prompt. She had me start writing them nearly as soon as I could write anything. Even today they are a beneficial habit, which I should be better about. It’s not that I don’t often write thank-you notes. I write quite a few. But the ones I do not write—that I know my mother would insist I should write—loom over me like a dark cloud until it’s been so long since they were “due” that I absolve myself of their necessity by rationalizing that it would seem strange and discourteous to send a thank-you note now, after such a long time. As I got older and my penmanship improved, my Uncle Hi continued my epistolary learning by exchanging letters with me. His name is actually Hiram, but my Aunt Jody always told me to call him Hi. That’s what everybody called him. “Hi! . . . Hi” was how I clumsily began most of our conversations. I remember having a hard time picking up any sort of meaningful conversational thread after botching the salutation, and phone calls would be quite formal. But when we wrote letters, it was much simpler. “Dear Hi.” There was a degree of sanctuary to it, and our written conversations took on a more vivid life full of honest questions and advice. In some ways, those letters did more to teach me how to write than anything else did. We still write to each other even now. I’m pretty sure I owe him a letter. Once, when I visited Hi and Jody in Ohio at their home, Hi pulled out a yellowing stack of handwritten letters marked by varying degrees of what can best be described as block letters, then primitive cursive, and, eventually, a bizarrely imitative version of my mother’s own handwriting. I was equal parts deeply touched that he had been saving my letters to him all these years and terribly embarrassed that an archive of (let’s just call them “early”) writings had been so neatly preserved. In that moment at Hi’s house, I felt a sudden flush of gratitude that my youth existed there, on paper, both tangible and private, as if I were the last of a dying tribe born with privacy, about to be overtaken by the perpetual and public preservation of youth by the new Internet generations. Don’t get me wrong; I believe the Internet can be a force for good. It is perhaps the greatest potential tool for organizing sustained campaigns of nonviolent civil disobedience that the world has ever seen. I like to ask students, What would Dr. King have tweeted? Or, What would Gandhi have posted? How could SNCC (Student Nonviolent Coordinating Committee) have used the Internet? By the end of the discussion, the students often realize that they would be using these tools as a means to get people to physically show up. It would be like giving Bayard Rustin a super–Swiss Army Knife of organizing tools; but it would not have changed the need for people to show up to the 1963 March on Washington to push for civil rights legislation. And that’s how I feel about mailing letters and postcards in the era of instant communication. Human beings are social animals. We need human interaction, and the further removed from the personal those interactions become, the less meaningful they are. If you’re trying to change someone’s mind, you need to be personal; you need to establish a connection to share your ideas. You need to make sure a very real part of you shows up to make sure your voice and your ideas are heard. That’s why I believe you should regularly write to your congressperson, or state legislator, governor, or the president to express your views on policies, and you should probably write by hand. It is no doubt simpler to throw some words into a contact form and hit Send, but having spent a good amount of time on the receiving end, I can tell you that a handwritten note will go a lot further. Some part of it certainly has to do with the personal intimacy of reading another person’s handwriting. But I’m also sure that some of it has to do with the spectacle of seeing thousands of pieces of paper, all individually constructed but united in purpose, laid out in support of or opposition to a particular position. So, what letter will you write? What words will you choose? Get started, because we need you now more than ever. If you're an avid fan of March, or just learned about this incredible graphic novel series, be sure to check out our Instagram giveaway of newly released March: 30 Postcards to Make Change and Good Trouble, MARCH journal, and special edition Good Trouble / Necessary Trouble MARCH pins. Special thanks to Chronicle Books for partnering with us to make this giveaway possible!